The Star Rover - ZineWiki - the history and culture of zines, independent media and the small press. 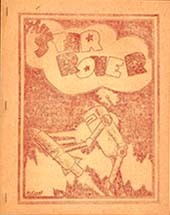 The Star Rover was a science fiction fanzine by Van H. Splawn, Fritz Hoffmann, and F. Lee Baldwin. The Star Rover was published in the U.S.A. and appeared in the 1940s and 1950s. At least seven issues of this mimeographed fanzine were released, though the first two issues were titled Phoenix. Issues 3, 4 and 5 were released in 1946. Issues 6 and 7 were released in 1951. Contributions included the articles "Forgotten Fantasies" by Redd Boggs (The Lovecraftsman, Sky Hook), "The Arkansas Time Traveler" by Van H. Splawn, "The Forgotten Age" by John M. Stadler, Jr., and "Dogmatica" by William Young; the bibliography and article "A Checklist of Edgar Allen Poe" by Van H. Splawn; and poetry by Walter A. Coslet (The Scientifictionist) and Atlantis Lee. The fanzine also included fiction such as "Island Bees" by editor F. Lee Baldwin, one of H. P. Lovecraft's circle of writers and correspondents. Other contributors included Larry Bassett, Jay F. Chidsey, Joe Kennedy (Vampire), Ron Lane (Gemini), Ray H. Ramsey, Jack Riggs (Lethe), and others. Art work was by Fritz Hoffmann, Lionel Innman, Arthur A. McCourt, Alva Rogers, Rick Sneary (The Outlander, Moonshine, Shangri L'Affaires), Van Splawn, and others. Splawn was a prolific editor from the mid-1940s to the mid-1950s, whose other fanzines included Djinn, The Fantasmith, Mars, Prometheus, Sevagram, Soma, Symphony, Time Stream, and Worlds Apart. This page was last modified on 9 September 2014, at 22:21.